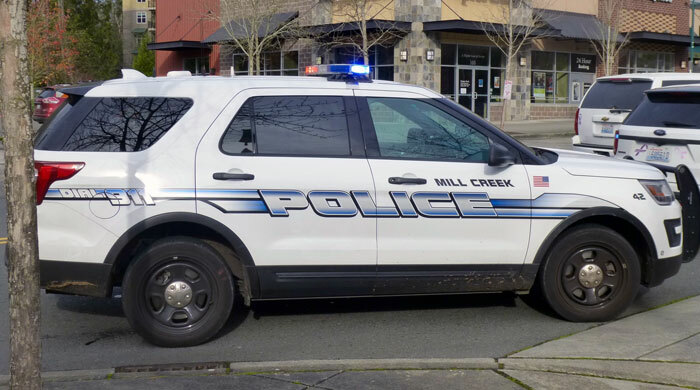 According to the latest Mill Creek Police Blotter, a total of 430 responses were reported the week of June 15th to June 21st, 2018. 05:44:28 - 13200 BLK BOTHELL EVERETT HWY: A Mill Creek officer responded to a hit and run incident in the 1900 block of Bothell-Everett Hwy. A semi-truck had made an illegal right turn and damaged new curbing. The truck left the scene. 13:54:15 - 16300 BLK MILL CREEK BLVD: PSO Pigott took a found property report for a WA State license plate, which was found at 16300 block of Mill Creek Blvd. 22:25:22 - 16400 BLK BOTHELL EVERETT HWY: Police initiated a traffic stop in the 16400 block of SR527. After making contact with the 26 year old driver, he was subsequently booked into Snohomish County Jail for a Warrant for his arrest without incident. 21:45:06 - 2800 BLK 140TH PL SE: Officers responded to the 2800 block of 140th Pl SE for a verbal domestic. A 27 year old Mill Creek male was arrested and booked into the Snohomish County Jail on a misdemeanor warrant. 04:06:19 - UNKNOWN: Snohomish County Sheriff’s Deputies stopped a vehicle for speed and failing to obey traffic a control device at the intersection of 132nd St SE and Dumas Rd. Officers responded and a 20 year old Mill Creek male was arrested and booked for Under 21 DUI. 04:06:34 - 13200 BLK BOTHELL EVERETT HWY: Police found a trailer hitch in the 13200 block of SR527. The trailer hitch was taken to the Police Station for Safekeeping and entered as found property. 19:34:31 - 14200 BLK NORTH CREEK DR: Officers responded to a verbal domestic in the 14200 block of North Creek Dr. Neighbors heard a very loud argument and thought they witnesses physical fighting between a male and a female. An investigation and interview of both parties revealed it was in fact just a loud argument and no assault had occurred. Domestic Violence resources were provided to both parties after verifying the couple would be okay together. 21:05:08 - 1300 BLK MILL CREEK BLVD: Police responded to a physical domestic that occurred in the 1300 block of Mill Creek Blvd. After investigation, charges were referred to arrest a 23 year old man for Assault 4 DV. 01:16:42 - 1100 BLK MILL CREEK BLVD: Police responded to the 1100 block of Mill Creek Blvd, to a report of a possible suicide in progress. Upon investigation and welfare check, no harm or possible harm occurred. 08:19:32 - 15200 BLK 14TH DR SE: Officers responded to a vehicle prowl in the 15200 block of 14 Dr. SE. Sports equipment was stolen from an unlocked vehicle overnight. 11:17:01 - 13800 BLK SEATTLE HILL RD: PSO took a found property report for an envelope with documents, which were found at 13900 block of Seattle Hill Rd. 14:41:46 - 16300 BLK MILL CREEK BLVD: Officers responded to a theft report in the 16300 block of Mill Creek Blvd. A bbq trailer was stolen from a parking lot overnight. 21:26:09 - 1500 BLK 136TH ST SE: Police responded to a malicious mischief report near the 1500 block of 136th Street SE after gang related graffiti was discovered. 21:35:44 - 3200 BLK 132ND ST SE: Officers contacted a male and female in the 14000 block of 35th Ave SE. The male had a current Protection Order that he was violating by being in the company of the female. The male was arrested and booked into the Snohomish County Jail. 12:11:51 – 14700 BLK MAIN ST: Officers responded to a report of a theft in the 14700 block of Main St. A 29 year old Mill Creek woman reported her vehicle had been prowled overnight. The only item stolen was a firearm she had left in the vehicle. 17:56:55 - 13500 BLK NORTH CREEK DR: Officers responded to a disturbance in the 13500 block of North Creek Dr. A 38 year old female and 40 year old male from Mill Creek were involved in a verbal argument. No crime occurred. 23:33:23 - 12900 BLK 19TH AVE SE: An officer contacted a suspicious vehicle in the 12900 block of 19th Ave SE. A 43 year old male from Mill Creek was arrested for violating a court order and booked into the Snohomish County Jail. 08:59:05 - 3900 BLK 137TH PL SE: Officers responded to a vehicle prowl which occurred near the 3900 block of 137 Pl SE. 18:02:39 - 2000 BLK VILLAGE GREEN DR: Officers responded to the 2000 block of Village Green Dr. for a verbal domestic. A 51 year old Mill Creek male was yelling at 15 year old Mill Creek female and a 17 year old Everett male. No assault occurred. 22:38:33 - 16300 BLK MILL CREEK BLVD: Officers stopped a vehicle in 16300 block of Mill Creek Blvd for a license violation. A 50 year old Everett male was arrested and booked into the Snohomish County Jail for DUI and DWLS 3rd Degree. 21:21:08 - 3300 BLK 132ND ST SE: Officers contacted a male in the parking lot of the 3300 block of 132nd St SE. During conversation it was revealed that the male had two outstanding warrants for his arrest. The male was taken into custody and booked into jail without incident. 23:08:53 - 15100 BLK 35TH AVE SE: Officers responded to the 15100 block of 35th Ave SE for a theft report. A 42 year old Bothell female stated that her backpack was stolen by a male she met online. The backpack was recovered by the Lynnwood police station with some items missing. Investigation is on-going. Click on this link to see the June 15th to June 21st, 2018, Mill Creek Police Blotter.